We’re about to embark on a tour of Italy’s most beautiful and historic regions – by way of the wines produced there. At Total Wine & More, it’s time for Discover Italy, our two-week exploration of the country’s wines, with in-store tastings, classes and special deals on some remarkable Italian wines. Italy’s wines come from all over the boot-shaped peninsula, which boasts a mix of terrains and climates providing ideal conditions for many types of vines. Combined with Italy’s reputation for wonderful cuisine – and the Italian tradition that considers wine part of a meal – it’s no wonder Italy is the source of so much good wine. This northwestern region translates as “foot of the mountains,” and its abundant hillsides offer optimal terrain for vines. Barolo and Barbaresco are classic Piedmont red wines made with Nebbiolo grapes; Gavi and Arneis are fresh and delicious white wines produced in the region. In Italy’s northeast, the cool climate is ideal for producing dry white wines – especially fine Pinot Grigios. The Veneto is Italy’s largest wine-producing area, home of the zesty Pinot Grigios and bubbly Proseccos we love. The region’s bright Bardolino and Valpolicella wines are wonderful reds for warm weather. This beautiful and central region is home to Sangiovese, the iconic Italian grape that produces the famed red wines Chianti, Brunello di Montalcino and Vino Nobile di Montepulciano, among others. The regions south of Rome have produced wine since the Greeks crossed the seas and planted vines 3,000 years ago. The warm south is a source for ripe and flavorful wines in both traditional and modern styles. That’s just a hint of the wines produced across the Italian map. Looking to really get to know a region and its wines? Consider our Under the Tuscan Sun class, a deep dive into the wines of Italy’s most storied wine region, held in our area stores Thursday, June 9. Or just stop by this weekend or next (6/9-6/12 and 6/16-6/19), when we’ll be pouring crisp whites, classic red styles and lovely aromatic sparkling wines, so you can Discover Italy one sip at a time. 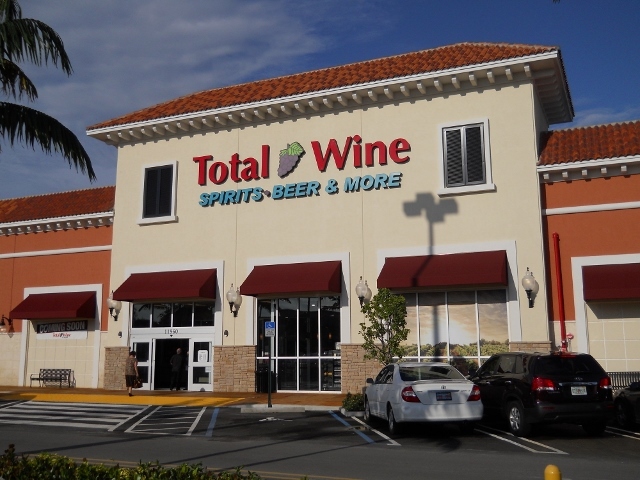 Total Wine & More opened the doors this morning at our brand new store in Kendall, Miami. To celebrate the occasion, we invited our team members, executives from our corporate office, vendors and media to a launch party last night. Smooth jazz played while several hundred guests sipped on fine wines, select spirits and enjoyed the Brewery District, a new concept designed by Total Wine to highlight a special beer area of our stores to give our customers an unforgettable beer experience. Ceviche, meatballs, cheese, fruit and several hors d’oeuvre were offered to balance the tastings. Store Manager Ty Ball, along with Assistant Manager Janell Grigsby and South Florida District Manager Brett Pulisic, greeted guests as they entered and chatted about the new store. All of the staff was extremely helpful, courteous and ready to answer questions. Though this was not a selling event, some guests just could not wait to make their purchases until the official opening at 9 am this morning. And we were ready! Vendors including Rich Nowak from Brooklyn Brewery, Peter Schnebly from Schnebly Winery and Brewery and Robbie Toombs from Gold Coast Distributors were also there to offer support for our new store. After guests were given the opportunity to try Caymus Vineyards’ exquisite 2010 Cabernet Sauvignon (among several other excellent wines), a few awesome Patron tequilas, Leblon Cachaca in Caipirinhas, and Goose Island and Back Forty beers, a toast was in order. Hundreds of champagne flutes were filled and guests congregated over by where the band played. EVP of Operations Mark Powell thanked everyone for coming and recognized all of the hard work that went in to getting the store ready for the launch. He introduced the store leadership and talked about the grand opening tonight. 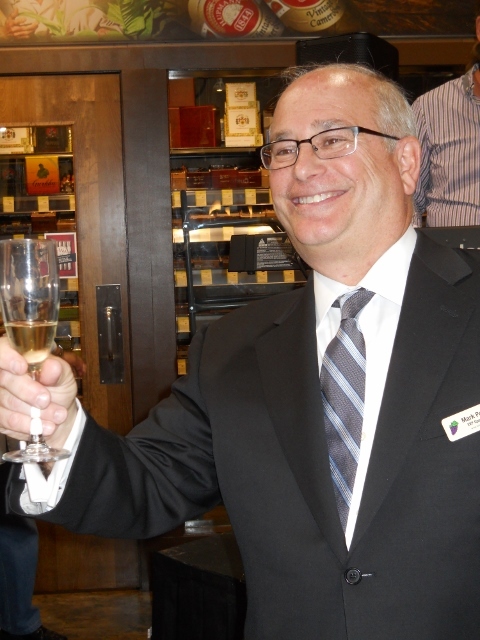 Then a toast to the success of the new store. We’d like to invite you to our Grand Opening Extravaganza tonight (May 23rd) from 6-8 pm. We will be featuring tastings with the Wagner Family of Caymus Vineyards and having live music, giveaways and an official ribbon-cutting ceremony. Total Wine will also recognize Read2Succeed as our local partner and make a substantial contribution to the organization during the event. Tip: The store is located beyond the traffic circle and past the Valet parking lot on the right side of Mills drive (Google shows the location too close to the main road). Sign up for our newsletter to receive valuable promotions, coupons and information about all things wine, spirits, beer, cigars, and more. We welcome your feedback and look forward to serving this new community.